Help us name Sunrise Crater’s Neighbourhoods! I’m excited to announce that after months of development, we are finally ready to reveal our next core feature, Neighbourhoods! ..but not like you might have expected! There is still a little while before we can release the feature fully, but we are revealing it early because we need your input! Neighbourhoods in the original TSO were very simple – any property could subscribe to any neighbourhood regardless of location, and they didn’t have any gameplay effect. While this allowed a lot of freedom, you often had neighbours whose lots were all in different neighbourhoods. There wasn’t even a way to list all houses in a neighbourhood – they were simply an afterthought to add a slither of community interaction to the original’s rather uninteresting city view. I’ve built a system entirely from the ground up that aims to bring living, active neighbourhoods to FreeSO, while adding new community elements, a lot more interactivity, and new competitive goals for sims to strive for. Our new Neighbourhood Page is just the start – a great many elements and gameplay features will be added with the neighbourhoods update. FreeSO’s neighbourhoods are fixed regions in city view that have a name and description that lets people know what that neighbourhood is all about. They’re centered on key features of the city’s landscape, giving each neighbourhood a unique identity. Interaction with neighbourhoods starts when you’re choosing the location for your lot – move next to your friends, in a community that you like, or just because you like the view. Neighbourhoods show up in far zoom when you hover them – clicking zooms in on them and opens their page, which highlights the top 10 properties and sims in that area among other things. 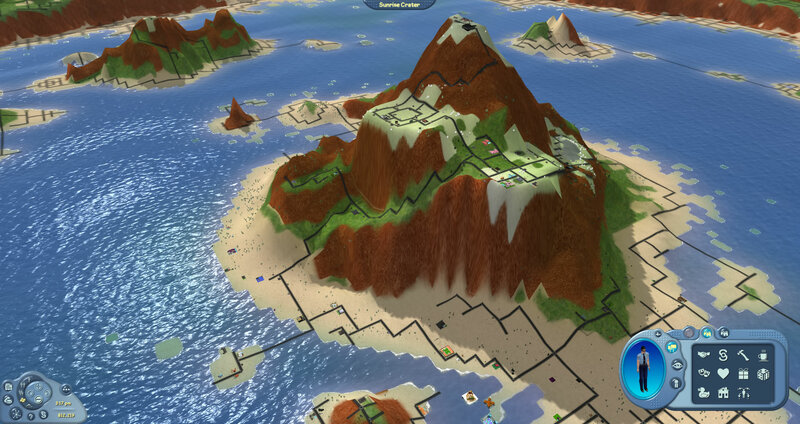 In popular neighbourhoods, resident Sims can compete in monthly elections to become its Mayor! Currently, Mayors are rewarded with three special powers that normal sims only dream of. Mayors have control over an additional lot over their normal residence – they can place and build the Town Hall lot for that neighbourhood without having to move out of their existing property! The Mayor’s ability to add objects and architecture to the Town Hall can also be shared with Sims they trust, by adding up to 100 “donators”. They also get priority on that neighbourhood’s bulletin board, and a special badge whenever they visit a lot in that neighbourhood. More details on these features will come on release! We’re posting this now because we need your help – we need names and descriptions for the neighborhoods in Sunrise Crater! This will be a lot less formal than the object descriptions – there will be no voting, we will be taking the best suggestions, and encourage you to work together with the people who live in that region (or want to) to pick the best. You can either post in the main stickied thread for small suggestions, or post your own thread for larger ones or co-ordinated efforts. These suggestions will define the state of Sunrise Crater for many years to come, so please give it a shot! The feature is still under heavy development, and since it has a large number of new systems it requires a lot of indepth private testing before we can introduce it on the public servers. You might not even see it this month, since its progress relies entirely on when I can work on it. But I guarantee it will be worth the wait! Note that because of our rather low playerbase and the scale of this feature, only the two most popular neighbourhoods will have elections and a Town Hall on the first month. This feature is designed for a large number of players in each city – I’m hoping we will see its full potential when we finally launch. If you want to be the first mayor of a Neighbourhood, consider moving where the most activity is! I hope you guys are as excited as I am about this feature – I’ll keep developing it over the weeks to come! In the mean time, get to suggesting! 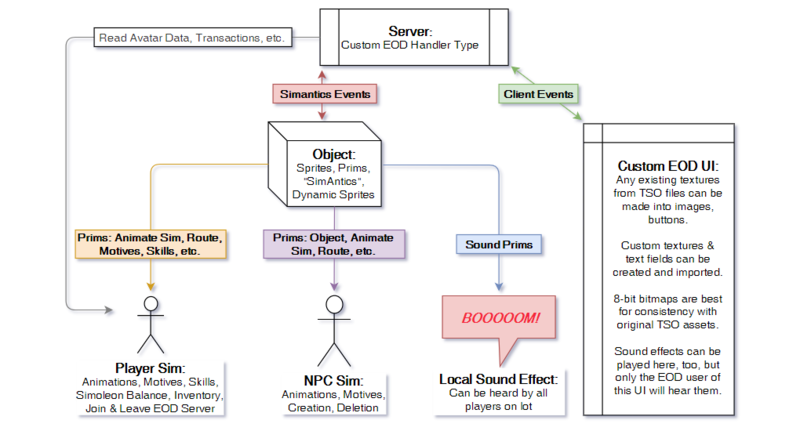 So You Want to Make an EOD? Oh how wrong I was…it would not be easy, but would take almost 9 months! Of course at the time, little did I know that this “blackjack” object had absolutely NOTHING done to it and that even creating BlackjackEOD would essentially be like creating custom content from scratch. But that would be a pleasant surprise for me later when I finally got around to opening the blackjack.iff and blackjacksemiglobal.iff in Volcanic…Nonetheless, this relatively new master remesher S1ndle guy delivered some amazing artwork faster than I could have imagined. That artwork would remain untouched for months, since after finishing the massive effort of RouletteEOD I would discover that the blackjack object resembled that roulette object quite a lot. Way too much…wow in fact it was just roulette.iff copied over with a few graphical and string/subroutine name changes. Crap. Hey everyone! While I’ve been busy working on a large feature myself, the rest of the team (mainly The Architect, S1ndle and Raeven) added two large features without my input at all – and they are absolutely wonderful! I didn’t want to delay these features, so they have been slowly been developed and refined in our GitHub repository on top of the last master build and thus can be released before I’m finished my own work, which still might take a while! Fawn has also partially joined the team to help with writing ingame dialogs, news posts, blog posts and is also helping out over on http://tsomania.net. Check out her new guide on building a successful house! The second large feature we’re adding this patch is really the start of something new: Group Skilling Objects. 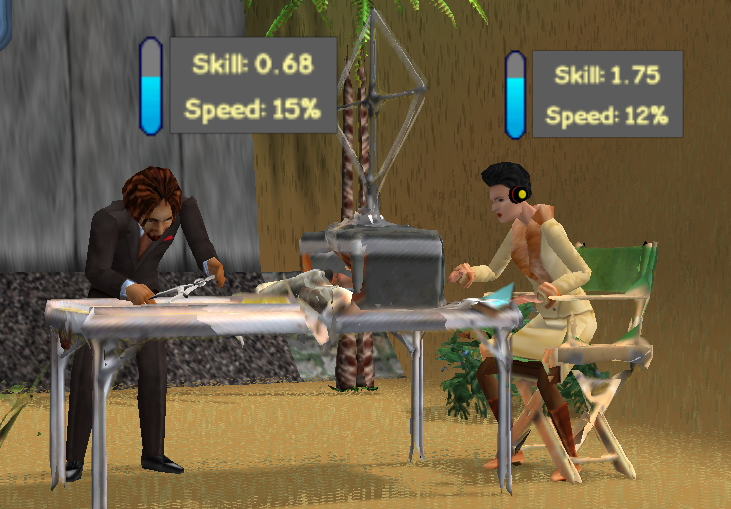 While earning money in The Sims Online has always given players a choice in how active or passive they want to make cash, skilling has always been passive regardless. While veteran players, many newer players interested in group money or jobs were forced to skill passively, when they wanted a more active game experience more of the time. With Group Skilling Objects, we’re offering the same passive/active choice that money has had since the start of FreeSO – with a twist giving it a key use in the late game for players with high skill, but wanting to reach their maximum payout potential. This should finally bridge this gap that more active players have been looking for, while allowing players who enjoy single money and skill to continue doing as they do. Everyone wins! The first of these objects is none other than Maze, which has been converted from a money object for important reasons we’ll go into later in this post. Gaining skills from completing a maze. Both players gain a 0.02 point bonus for their efforts, on top of the normal skill increase based on the number of other skillers on the lot. Motives decay much faster, but each “win” will reward your motives back. Success will give you a constant skill bonus of around .02 skill. At lower levels this doesn’t mean much, but at high skill levels .02 could take 10 minutes to obtain normally. This is on top of the base skill level, so you’ll always gain at least as much as a normal skill object, even if you fail or lose to the other player (eg. in wargame). These benefits are an upgrade over single player skilling objects, but similar to group money, they are not a replacement. The decision is up to the player – a more active, focused experience for a quicker skilling path for more active players, or a more passive experience for players who just want to gain skills while chatting, working in the background or hanging out. Maze 1.0. This follows the old maze rules from the tso money object, but with random mazes and a better distribution of path lengths. Skills Logic/Charisma. Wargame. This object now follows our group skill rules and skills Creativity/Creativity. This was always a group skill object, but it didn’t have the thought put into it that our new system does. Lost? Architect has outdone himself this time – the new implentation of maze features some quality of life changes to make the board easier to process. 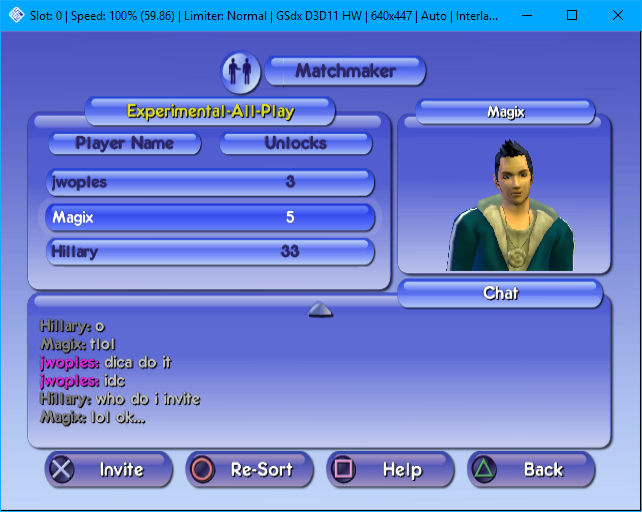 Due to one of the many technical developments since 2003 (screenshots being easy to share, which does not make the game any easier but can make it essentially 1 player), Maze’s original game design can be broken even easier than is was back then, where they used preset mazes that could be macro’d. Our maze implementation generates entirely random mazes every time, with the exit a guaranteed and known distance range away from the start point. While our changes to maze to generate random mazes mitigate some of these issues, the original maze design is still too breakable to award something as permanent as money. However, we’re a re-implementation project, and the original maze didn’t deserve to die any more than TSO did. Due to skill and motive decay making the benefits of group skill objects transient, a group money object awarding these benefits sits a lot better than one that could be abused for a permanent advantage. While the abuse might be minimal due to maze still being as difficult, it’s more a factor of its affect on player morale more than anything. A variant of maze will be introduced in future with the Gameplay rethought to be more resilient against modern tech, as I have stated in the past. We’ve dubbed this “Maze 2.0”, and will be revealing more details in the future. The money group object rectangle will be complete! Additionally, for Maze and our next feature, you will be able to toggle their new and old behaviour on a server level some time in the future. If someone capable were to take the game in a different direction, and even just go full vanilla, they should be able to do that by the time we launch. This is a re-implementation project first and foremost, after all. This distinction will let us go our own way with game changes, as we have been, to freshen things up and try our new ideas that TSO/EA Land never would had the chance to. I think I’ve spoiled enough about what I’m still working on, so I’m going to leave you hanging there. I will end with two extra announcements: the first is that we will be moving the server software to .NET Core rather than Mono, which should provide more reliable memory usage and performance in line with what we test on our Windows development machines. The second announcement is that you can now choose your reaction to player interactions before they occur. Now you can finally hot kiss 100 times without even pausing for a moment. Surprise! We have a special update for you – and it’s not even what we were teasing in the last blog post! It will release in a few hours, along with the announcement of a whole new class of object and a long awaited one. 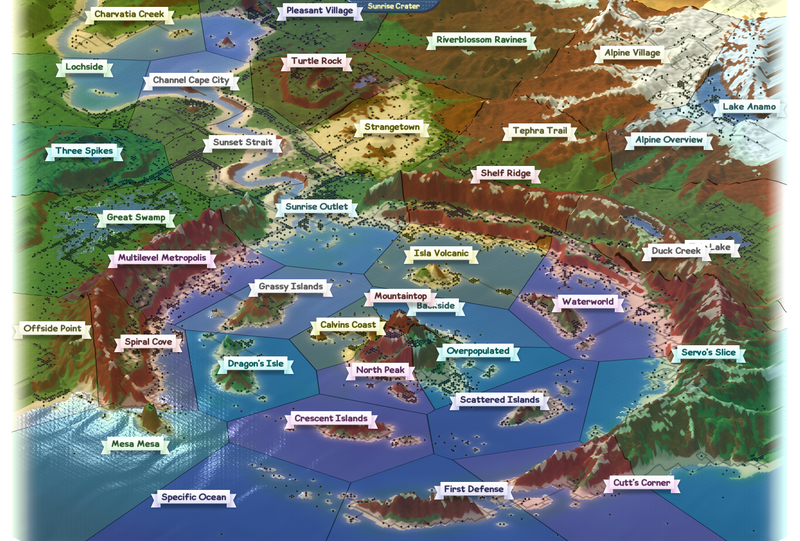 A blog will follow shortly after explaining everything – so stay put… in the meanwhile, we can go into a bit of detail about how this crazy project came about, the effort that went into it, and how the game actually works. Texas Hold-em is coming to FreeSO, thanks to the efforts of everyone on the team! 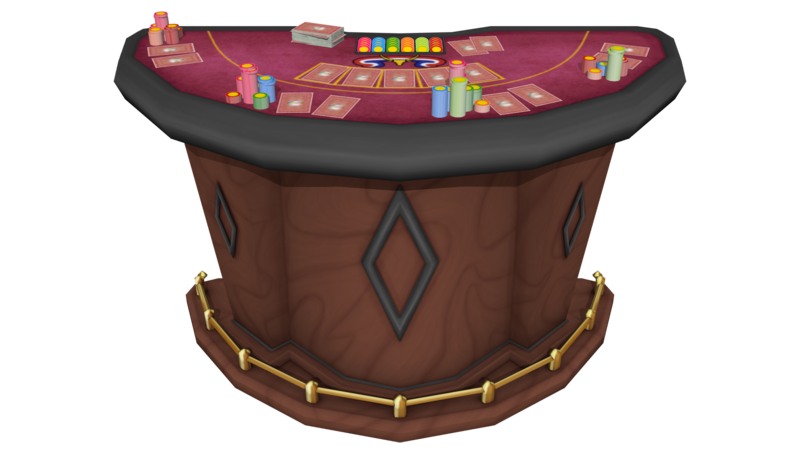 We’re also releasing a new set of objects tailored to casino environments, as you can see above, which you can get from the in-game catalog. 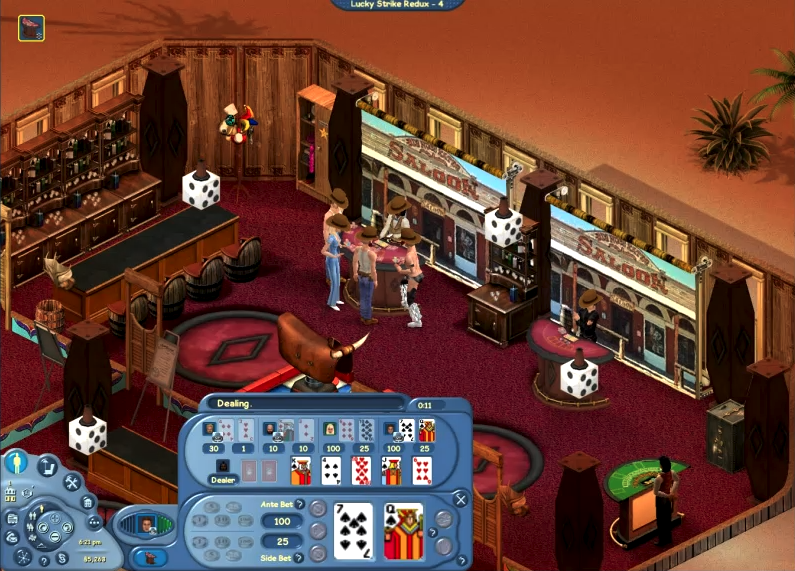 You can even get virtually plastered at the bar – a perfect casino experience. 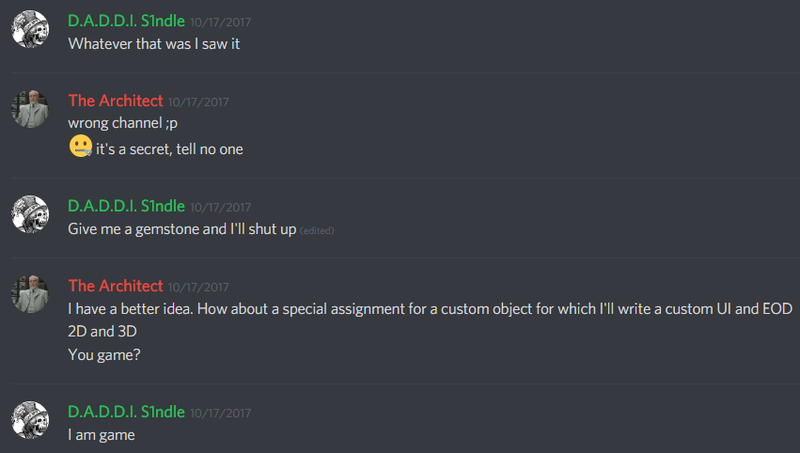 Long, long ago in the far off time of October 2017, after a joking back and forth with one of the admins I was recruited for an extra special secret project. The Exchange that started it all. The extra special secret project was a collaboration between The Architect, M.O.M.I. Raeven, and myself, we were going to create a clone of the unused Blackjack table, give it new art assets and gameplay, and turn it into Texas hold ‘em. My task was to create the art assets necessary for the object while Architect and Raeven worked on the underlying code to make the object actually function. A brief timeline of the creation of the Texas hold ‘em table, from early conception to first version. Since the object was to be a clone of the Blackjack table and would recycle the animations and much of the code I had to keep the new Texas hold ‘em table within the same basic blueprint to make it work with the animations better. I had originally had it set at a normal table’s height since I did not know how tall the actual Blackjack table was. And overtime you can see how it morphed into its final form. However it was decided that the original Blackjack table would be a higher priority since it was missing much of the code needed to make it work, and so efforts were shifted to that, in fact it was missing so much that the table had to essentially be remade from scratch, which Architect and Raeven did so very beautifully. 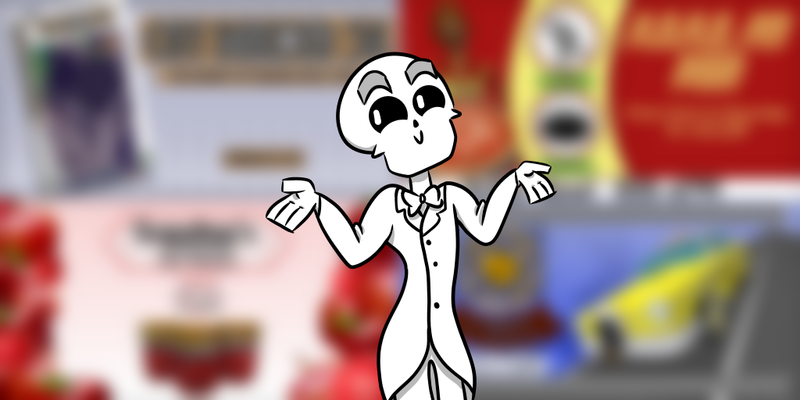 At the same time it was also decided that in order to get some Custom Content out faster the Texas hold ‘em table would be shelved for the time being, this lead to the creation of two new slot machines, two taxis, christmas pudding, and a few other miscellaneous objects. Back in January I came up with the idea of releasing several objects alongside the Texas hold ‘em table, in a set I referred to as ‘High Roller Stuff.’ This set was set to be expansive, with tables, chairs, and many other objects. However most of them ended up being cut to save on work time, gone was the coffee table, end table, buffet table, dining table, shrimp platter, dining chair, bench, tip jar, and trash bin, and alongside work on this set I set out to revise the original Texas hold ‘em table since at this point I had changed the techniques I used for modeling and texture painting, and ended up with the version seen in-game. The whole point of this set of objects as decided by Architect, was to show to the community at large that custom content was indeed possible with a little bit work and some elbow grease, and alongside the release of the set came a guide on creating your own custom content for FreeSO written by the amazingly fantastic M.O.M.I. Raeven, and a guide on creating EODs written by the also amazingly fantastic Architect. Similar to poker, the goal of Texas hold ’em is to have the best poker hand on the table. However, in Hold’em Casino all you need to have is a better poker hand than the MOMI dealer. This means your friends can stay your friends, and you will not have to worry about practising your poker face in the bathroom mirror. 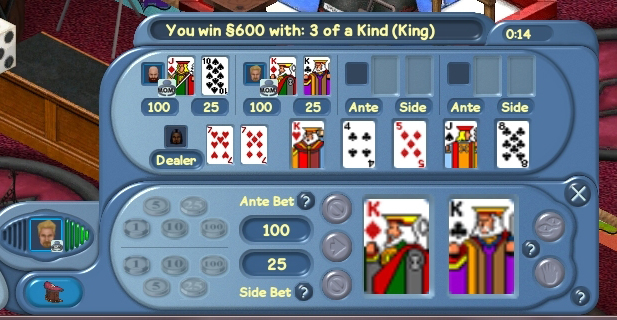 A poker hand is a set of 5 cards that contain combinations, for example pairs, four of a kind or a royal flush (a list of these can be viewed on the items “Learn to Use.. Payout” option). In hold ’em there are up to 7 cards that your poker hand will be selected from. Start off by choosing your betting amounts. There are two kinds of bets you can make in hold ’em. Firstly, is an “Ante” bet. This is your mandatory bet towards having a winning poker hand. Think carefully about how much you want to bet as if you decide to “call” (explained later) you will have to pay twice the amount of your Ante bet, on top of your initial bet. You can also play an optional “Side” bet which we will discuss in a moment. After placing your bet, the first round of cards will be dealt out. All players (including the dealer) will receive 2 cards. Next, 3 community cards will be placed in the centre of the table. The dealer’s cards will not yet be revealed, so you will have no idea what their poker hand will consist of. If you initially placed a side bet and your 2 cards plus the 3 community cards contain any poker hands (this will be automatically calculated and must be a pair of aces or higher), then you will instantly win that bet! Now comes the tough decision, do you fold or call? If you think your hand could be an even bigger winner, you can call. This will force you to pay double on top of your initial Ante bet, however the 2 final community cards will be flipped over, meaning out of the 7 available cards your chances of having a poker hand are much higher. Any winning hands are automatically calculated and paid out. If you do not want to risk calling because your hand is terrible, you can fold, which removes you from that round and your ante bet will be lost. So put on your cowboy hats and smash your piggy banks! The real question is, are you feeling lucky?